Berthon USA specializes in the presentation of high quality yachts – both sail and power. 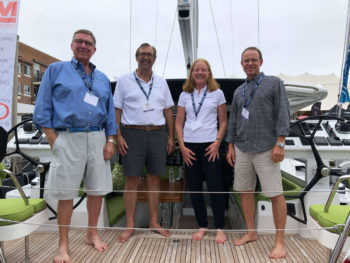 Berthon USA is run by Jennifer Stewart and Alan Baines. Bill Rudkin and Mark von Drashek complete the Berthon USA team. With years of experience, the office’s reputation is second to none. Berthon USA is the East Coast agent for Moody and Rustler Yachts of the UK. Moody, with their history in the luxurious cruising yacht sector, currently produces an aft cockpit 41 and 45 footer which look the business. Their well-appointed deck saloon models range from 45 to 62 feet. Rustler produces a range of yachts from 24 to 44 feet, that include the beautiful classic 24 daysailer, the long running long keeled 36, the fast 42, and a 44 foot deck saloon cruiser – all bespoke for the discerning yachtsman. Our brokerage business is strong across all segments of the yachting market, and we have a wealth of knowledge and experience with the sales of yachts of Scandinavian manufacture such as; Swan, Najad, Sweden Yachts, Baltic, Contest and Hallberg Rassey. Berthon USA is also pleased to offer brokerage power yachts. Such selections are typified by the Classic Down East style day boats and cruisers as well as trawlers and motor yachts. As our sailing yacht clients know, all these selected offerings continue to be in great demand for those who desire the best that such quality yachts can offer. Our brokers will find your perfect yacht for you, no matter where it lies. Berthon USA is skilled in managing both domestic as well as overseas transactions including the organizations of pre-purchase survey, ownership transfer, yacht transport and delivery. Good yachts are difficult to locate, especially those of new construction. If you are considering selling your current yacht, Berthon USA would be delighted to have the opportunity to assist with that sale. With its wealth of experience, and as part of the Berthon family, Berthon USA gets outstanding results for the clients, buyers and sellers alike.